WildBit Viewer is provided as freeware for private (non-commercial) or educational (non-profit organization) use. In other cases (for example commercial use), license is required. This means, that you must buy single license or multiple licenses in order to use it. In one license case, you are granted the right to use WildBit Viewer on one computer. In multiple licenses case, you are granted the right to use it on the number of computers, specified in the purchase order. 1 license = 1 computer use. WildBit Viewer Pro is provided as shareware. This means, that you must buy single license or multiple licenses in order to use it. 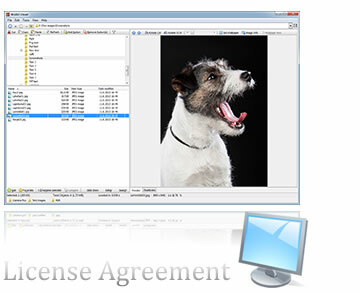 In one license case, you are granted the right to use WildBit Viewer Pro on one computer. OUT OF USE OR PERFORMANCE OF WILDBIT VIEWER OR WILDBIT VIEWER PRO REMAINS WITH YOU! In no event shall Marko Hietanen (WildBit Software) be liable for any damages whatsoever (including, without limitation, damages for loss of business profit, business interruption, loss of business information, or any other pecuniary loss) arising out of the use or inability to use this product. WildBit Viewer and WildBit Viewer Pro is owned by Marko Hietanen (WildBit Software) and is protected by copyright law. You may not reverse engineer, decompile, disassemble, modify: WildBit Viewer or WildBit Viewer Pro. BY USING WILDBIT VIEWER OR WILDBIT VIEWER PRO YOU ACKNOWLEDGE THAT YOU HAVE READ THIS LIMITED WARRANTY, UNDERSTAND IT, AND AGREE TO BE BOUND BY ITS' TERMS AND CONDITIONS. YOU ALSO AGREE THAT THE LIMITED WARRANTY IS THE COMPLETE AND EXCLUSIVE STATEMENT OF AGREEMENT BETWEEN THE PARTIES AND SUPERSEDE ALL PROPOSALS OR PRIOR AGREEMENTS, ORAL OR WRITTEN, AND ANY OTHER COMMUNICATIONS BETWEEN THE PARTIES RELATING TO THE SUBJECT MATTER OF THE LIMITED WARRANTY.